The points and throwbar are protected with tape to keep ballast out of the moving parts. The ground throw can be seen to the right. Note the painted rail and the replacement ties installed under the rail joiners at left. ©2011 Ryan C Kunkle, licensed to About.com, Inc. It is easiest to take care of a few aesthetic details before you start adding ballast. Replace any missing ties you removed from the ends of track while making the joints. Paint all of the rail and ties. You can do this with a brush, paint pens or an airbrush. Hook up and test your mechanism of choice for throwing the switch. This can be a manual ground-throw like the one shown here, or an electric switch machine / motor. Make sure everything works properly before you add any ballast. When you are ready to begin adding ballast, put a strip of tape across the points at the throw-bar. This is the piece that slides back and forth and holds the end of the points. Cut the tape wide enough to cover the throw-bar and neighboring ties. This prevents stones and glue from obstructing the points as you proceed. Apply a bead of white glue around the base of the track and roadbed. This will help hold the bottom of the ballast in place. ©2011 Ryan C Kunkle, licensed to About.com, Inc. The next steps for ballasting the switch are just like that for regular track. Begin by spreading a layer of glue on the shoulders to help hold the bottom layer of ballast in place. Use straight white glue. Put a small bead along the base of the cork roadbed and the outside edge of the ties. Spread the glue around with your finger. A thin even layer is all you need. Ballast is distributed evenly over all of the track. This ballast is almost ready. Make sure to keep ballast out of the points and flangeways all around the switch. A well-groomed shoulder is the sign of proper maintenance. ©2011 Ryan C Kunkle, licensed to About.com, Inc. It's time to start spreading the ballast. There are many colors and varieties of ballast out there. The techniques are the same for all. Sprinkle on ballast slowly, getting as even a layer as possible. Take your time with this step. It is always easy to add more than sweep away the excess, espescially around switches. Make sure the ballast shoulders are completely covered. Note that the switch you see here represents one that receives a high degree of care and regular maintenance. 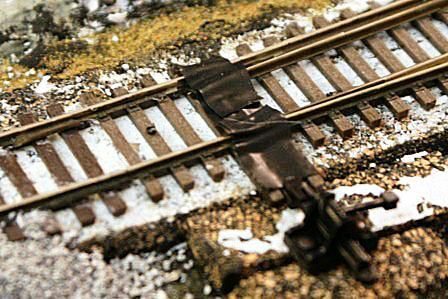 Depending on the type of track you are modeling, your ballast may not need to be so well groomed. Regardless, you'll want to keep the mechanics of the switch clear. A stiff brush helps sweep every last stone into place and away from flangeways and off of ties. ©2011 Ryan C Kunkle, licensed to About.com, Inc.
Once the ballast is spread, take your time and carefully groom everything into position. Use a small stiff paintbrush to sweep stones from the tops of ties, out of guardrails and flangeways in the frog and away from the sides of the rails. This is by far the most laborious part of this job, but it will pay off. A hasty job here will show. Thoroughly wet the ballast with Isopropyl Alcohol to make the glue flow freely through the stones. ©2011 Ryan C Kunkle, licensed to About.com, Inc.
Now that everything is in place, we need to keep it there. If you try to pour glue directly onto the ballast at this point, it will pool and bead, ruining all of your hard work. To prevent catastrophe, the ballast needs to be wet. The trick here is not to use water to wet the ballast but 70% Isopropyl Alcohol. You probably have some in your medicine cabinet right now. It is cheap and easy to find at pharmacies and grocery stores. The alcohol will prevent the capillary actions of the water, allowing the glue to flow freely through the ballast. Apply the alcohol with a spray bottle. Use a bottle that can produce a very fine mist. Start by holding the bottle a good distance away and do not point the spray directly at the ballast. Apply a very light mist and allow it to slowly rain on the scenery. A direct spray or hard mist will disturb the ballast. As the scenery gets more saturated, you can apply it a little more directly. Soak the scene completely. The glue will need to soak down through all of the stones or you will be left with a thin flaky crust. Great for pie - not so good for ballast shoulders. Apply a very liberal amount of glue to the entire area. Start slowly and work in layers to avoid wash-outs. Too much is never enough. ©2011 Ryan C Kunkle, licensed to About.com, Inc.
With the ballast wet with alcohol, it is time to add glue. Start by creating a watered-down white glue to bind everything together. Use an old glue bottle. Mix a 50/50 mix of white glue and water. And shake well. Dribble the thinned glue onto the tracks from the glue bottle. Start in the center of the track. Then work along the ties on the outside of the rails. Apply more glue at the base of the ballast shoulder. Then fill in the voids. As with the alcohol mist, start slow and continue to add more as the glue begins to set to avoid a wash-out. How much glue to use? As you can see in the picture, when you think you've gone too far, add a little more. Because the glue is so thin, it penetrates well but has lost a lot of its strength. The glue will dry clear no matter how much you add, so be generous. When finished, the throwbar, points and operating mechanism should all be free of glue and stones. Throw the switch repeatedly as the glue dries to prevent lock-up. ©2011 Ryan C Kunkle, licensed to About.com, Inc.
With the glue down, its time to go back to the points and the throwbar and make sure everything is still working properly. Begin by removing the protective tape. Hopefully this has kept most if not all of the stones and liquids out of the gaps between the throwbar and ties. If there are any stones in the way, sweep them out with a brush or toothpick. This is easiest while the glue is still wet. If you are using a ground throw as seen here, there is a good chance some glue has worked into the mechanism as well. Use a paper towel to soak up as much as you can. Apply the towel to the throw only - avoid touching the ballast on the ground. Unless you completely flooded this with glue, it will be fairly easy to break it loose even after the glue has dried. Work the points several times back and forth. Make sure there are no stones preventing the point rails from closing completely in either direction and everything slides freely. As the glue sets over the next several hours, it is a good idea to go back and throw the switch a few times every now and then. This will help prevent a lock-up if any glue has flowed into the critical areas. A sanding block quickly removes any glue residue from the rails. ©2011 Ryan C Kunkle, licensed to About.com, Inc. The final step in the ballasting this switch is to clean the tops of the rails. Although glue wasn't purposefully poured on the rails, there is a good chance they've acquired a little. This glue will prevent good electric conductivity to your trains. A small sanding block like this works very well to remove the glue once it has dried. A few swipes and you're done! Enjoy your track - it should work as good as it looks.